Stop clearing and deforestation. The rainforest is critically endangered. This picture speaks of minor damage that individual farmers cause in the course of their life. 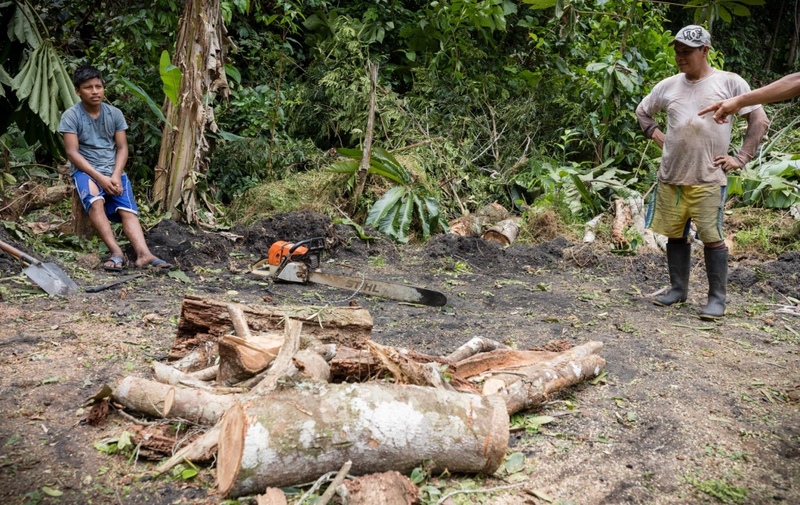 The fact that money in Tamshiyacu is hard to get makes some farmers use a chainsaw – either to sell a tree, make charcoal from it, or even burn down whole forest pieces. Slash-and-burn: The myth of better soil fertility after slash-and-burn is far from over. The migratory cultures of the Amazon never lived a long time in one particular place. Also floods were a reason for constant migrations of a clan. Employment and education opportunities made people settle down. Their knowledge of a sustainable and sedentary lifestyle with permanent agriculture is very small. In 2011, however, a much greater threat came along. Large-scale deforestation for monoculture. 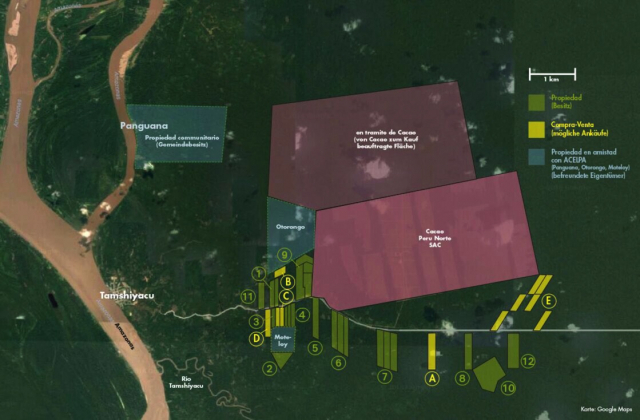 Within a year 6000 hectares of rainforest were allocated in Tamshiyacu. A big company that wanted to offer the cheapest cocoa in the world began its sinister work. 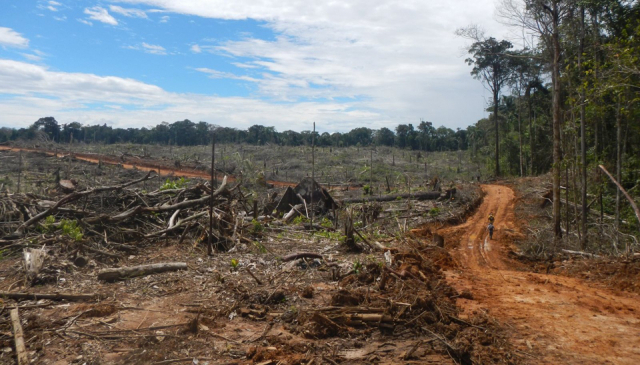 The company founded numerous subsidiaries and raised in the Amazon region of Peru claim to a total of about 145 000 hectares of forested area. To this extent we have been able to prevent deforestation so far. Again and again, there were new court decisions that put the company in the wrong, imposed penalties, but a poorly equipped police could not stop the deforestation. How could that happen? And why is the government looking supposedly helpless? To understand that, you have to go back in time. The forest is national property in Peru and thus protected by law, nobody can attack it. But laws can be avoided if it is planned long and carefully. Under alleged commitment to the rights of the peasants, a law was passed under the government of Alan Garcia about 30 years ago that made the registration of forest land as a matter of principle possible. A small detail became a fatality: a change of use defines the forest after its registration as agricultural area. Thus, this forest falls from the protection of the forest laws. There were different ways to get property – one way was the constant management of land. First you got the “Constancia”, which could be converted to “Titulo” after several years of care. Expensive procedures that requires money. Thus several family members often joined together to raise the money for the costly applications and receive as much land as possible. The easiest way was for civil servants and state officials. They were given large estates by the government, along with titles – in Tamshiyacu alone, more than 6,000 hectares, called the “Bufaleros”. Huismann, ‘Tax Money for the Kokamafia’, a WDR film shows how even large organizations are entangled in this trade of land and coca. Tamshiyacu is also affected. The financial situation of the people in Tamshiyacu opened the door to companies for their ominous work. Meanwhile, many of the feared consequences have arrived. The moral cohesion of families is being crushed by money and foreign workers. The money sows resentment and discord. And the people and machines worked day and night to clear the forest for the companies.